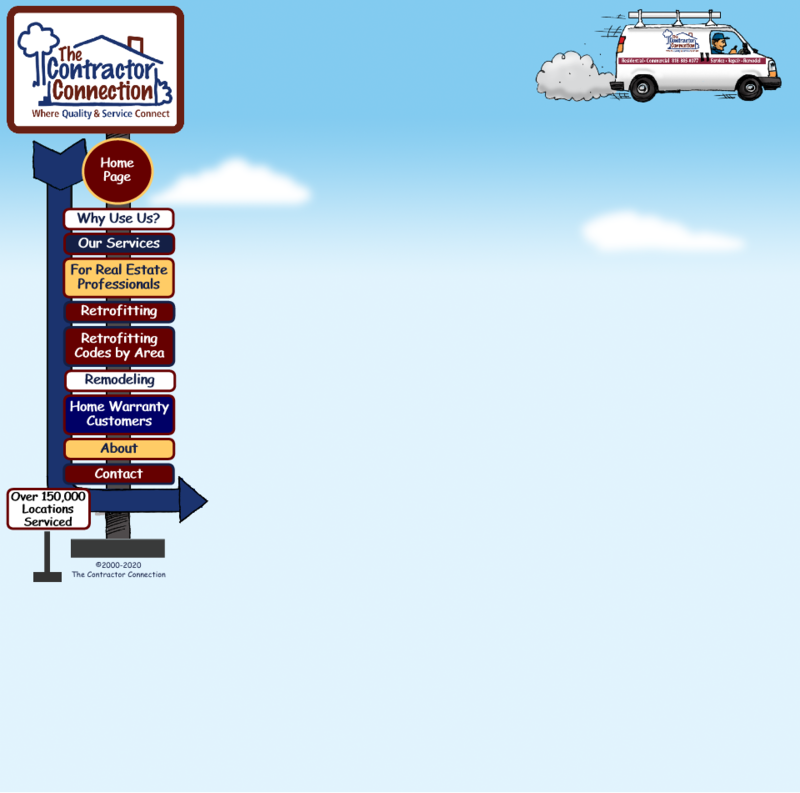 The Contractor Connection was created to provide homeowners, real estate professionals, investors, property managers, business owners, and fellow contractors, a company they can look to for ALL their Service, Repair and Remodeling needs. Our company serves the Los Angeles County and Ventura County areas and boasts many ongoing and repeat customers. We are the sole service provider for several entities and are grateful for the success we enjoy. The Contractor Connection is A+ Rated with the Better Business Bureau. With supply and material warehouses in multiple locations, our ability to retrive needed replacement parts is expedited by this convenience. Add to this our abundantly stocked service vehicles, and immediate remedy and repair are almost certain. Especially with dozens of repair technicians on staff! Assorted construction professionals comprise our talented staff of skilled tradesmen and accomplished workmen. Their continual display of camaraderie and teamwork help our projects run smoothly and successfully. Our notable record of customer satisfaction is predicated upon our staff being able to productively work in concert with one another. Everyone for whom we work remarks about and expresses appreciation for our detailed estimating system. The precision and thoroughness reflected in our estimates assists our clients by making it easier to compare competitive proposals. We are usually asked to be "first on the scene" to provide the "first estimate", so others may then be presented with an accurate scope of needed repairs to insure continuity. This is likely, one of the main reasons we are for so many of our clients, their "favorite contractor". The Contractor Connection maintains licensing as shown below. The Contractor Connection is EPA Certified to properly Renovate, Repair and Paint homes containing lead based paint. The Contractor Connection is distinctively qualified to provide initial planning, design and architectural development, as well as sound construction and tastefully decorated homes. Our system and experience, again and again, prove to be time and cost efficient. Celebrities, Professional Athletes and Corporate Executives bolster a long list of clients impressed with our confidentiality and professionalism. Homeowners, Real Estate Professionals, Investors, Home Warranty Companies, Property Managers, Business Owners, Restaurants, Movie Theaters, Medical Facilities, Barber Shops, and Commercial & Industrial Complexes. A significant portion of our business is dedicated to working with and supporting fellow contractors on their projects. Sometimes The Contractor Connection fills the role of a sub-contractor and at other times that of a business associate. In these cases, we use unmarked vehicles and ordinary clothing, which allow us to blend in with our Fellow Contractors without attracting attention. Most importantly, Fellow Contractors are impressed with how we dedicate ourselves to serving them. We become their advocate and represent them by assuming a role of assistance at any level they desire. Many times we are asked to assist with presenting an estimate to their clients and describing work to be performed. The Contractor Connection always maintain the focus of whom we represent and remain loyal to our relationship. Webster’s defines Honesty as, “Fairness and straightforwardness of conduct”. Be as honest as we can by conducting business in an ethical manner, with straightforward honesty and without deception. Do what we promise to do and under the terms and in the timeframe specified. Interestingly, when we all wrote down what we felt were the most important principles a business should develop, Honesty and Fairness were at the top of the list for every family member. Always grant the benefit of the doubt. Passion has been defined as, “An intense emotion, compelling feeling, enthusiasm or desire for something”. Be enthusiastically passionate about everything we do. Do everything possible to make our customers feel satisfied with what we do. Pretty simple. If our customers are satisfied with what we provide, then we’ve achieved our goal and feel satisfied too. By constantly focusing on these 4 principles, we repeatedly achieve our goal of connecting “Quality and Service”. We are very grateful that thousands of repeat customers substantiate our success. So please, zip through our website and feel free to contact us if you have questions, would like something explained or wish to schedule an estimate or project.